I recently became a Green Member of Starbucks new(ish) rewards program. It took me a while to get this status. They started the program a bit ago and I registered and started earning Green Level Rewards. They then changed the program and I lost my reward status and had to purchase 5 again to requalify for a rewards status. I was a bit annoyed. BUT finally I purchased another 5 drinks and therefore now hold Green Member Status. You might be wondering why I even go to Starbucks considering the high prices conflicting with my thrifter status...but I just love buying speciality coffee. I've written several posts about this obsession. Read more of them here. Overall, the rewards program is growing on me. With my Green Membership I qualify for free flavor shots, free refills on hot and iced coffee and tea, a free birthday drink, some special coupon offers, and a free beverage with a whole bean purchase. To register for a membership, you must use a Starbucks giftcard to pay for your drinks - so you have to continually load it with money (which can get you in trouble). Then you must register the card online to start earning member rewards. 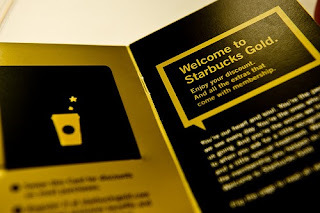 Beyond the Green Membership, you can also earn a Gold Membership which is reached after purchasing 30 Starbucks drinks (slightly less than a car payment). At that point you start earning one free drink for every 15 you buy. This is clearly for the Starbucks-a-holics. I think the Gold rewards are a bit weak but then again, this deal clearly isn't set up for me. Overall, I enjoy St. Arbucks (as they call it in England), though I'd rather support the local mom and pop coffee shop. BUT, as the spring thankfully approaches, I plan to begin ordering tall iced coffees with a free mocha flavor shot and as many free refills as I can handle for a mere $1.45 on my future visits. They really shouldn't let us thrifters in on these membership deals. We're just going to take advantage of them.